Posts categorized "Media & Technology"
C6C contributor Mitchell Szczepanczyk is involved in many media-related activities in Chi-town, including Chicago Independent Media and the Chicago Indymedia Video Collective. The latter created Chicago Independent Television in 2003, and has since cablecast 43 episodes on CAN TV. We have their latest segment on the Obama victory rally below. You can watch all four parts or past episodes here, or on their own Youtube channel. About 100 CAN TV staff and supporters, who filled a Chicago City Hall conference room for an October 31st finance meeting, left the conference room in disappointment when the meeting ended in recess before a vote could be called over an ordinance to help fund CAN TV. The meeting of the City of Chicago Committee on Finance ran about four-and-a-half hours without a break, from a listed 10 a.m. start time until about 2:30 p.m. The meeting was called in recess by Chicago Alderman and Finance Chair Edward Burke (14th Ward) when the meeting recorder was forbidden from continuing to work, and there was no replacement recorder ready. On Friday December 7th from 5:00 to 6:30PM, about a dozen media activists braved freezing temperatures, a blockade of violence-prone Chicago police, and thousands of mostly indifferent holiday shoppers, to take part in the 2007 Chicago Media Action Holiday Singalong. It was held outside of Tribune Tower, the national corporate headquarters of the Tribune Company. The media giant's TV station and newspaper cross-ownerships have come under an increasing level of scrutiny by the public and Congress due to FCC actions concerning the pending sale of the Tribune Company to billionaire Sam Zell. Everyday Colin Beavan cycles home from work through Manhattan, walks up nine flights of stairs, and cooks dinner with his family using only organic food grown within a 250-mile radius of Manhattan. After the sun goes down, they use candlelight and usually go to bed early, not having the luxury of electricity to let them stay up late. Why is Beavan's family doing this? Beavan has a goal: no net impact on the environment for one year. FCC Public Hearing on Media Ownership - Tomorrow! If you're passionate about media ownership/reform issues, tomorrow is an unprecedented opportunity for you to make your voice heard. The FCC Public Hearing on Media Ownership is taking place right here in Chicago at the Rainbow PUSH headquarters. The hearing is free and open to the public. Anyone (including you!) can make comments during the open mic segment of the hearing. There are a multitude of resources available for those who are interested in attending, but one of the most comprehensive has been organized by media reform organization Free Press. Click here for resources. Free Press has also organized free buses to the hearing, so there's little to no excuse for not being there! Check back at Chicago 6 Corners for post-hearing coverage and comments. If you know Nick Ostdick, you probably love him – his energy and drive, his appreciation of books and writers, his brooding, Clooney-like good looks – he’s something else. If you don’t know Nick, here’s what you should know: he is the publisher of RAGAD, a columnist for 63 Channels, a blogger, and the author of the novel Sunbeams and Cigarettes, which he wrote and got published while still in his teens. I recently had the chance to give Nick a shout and talk writing with him. As expected, he was the most interesting person I connected with that day. Chuck Mertz - a self-described "bitter, blind, broke, gap-toothed radio show host" -- has taken Chicago north side radio listeners to Hell for more than nine years. 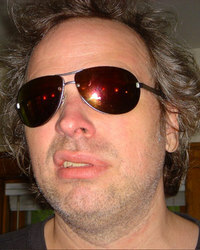 His weekly radio show, "This Is Hell", has aired four hours every Saturday morning on the northside and north suburbs at WNUR 89.3 FM - or online at wnur.org. This Is Hell features long-form interviews (sometimes an hour long) with acutely perceptive questions. The guest list is expansive to say the least, and ranges from mainstream liberal icons (like Ambassador Joseph Wilson and political "framer" George Lakoff) to icons of the American left (on a single episode some weeks ago, Chuck interviewed Noam Chomsky, Howard Zinn, and Patrick Cockburn as three of his five guests). And I think Chuck is funny. He certainly leavens every interview, and most every segment of This Is Hell, with jokes and witticisms. On September 20, 2007, the Federal Communications Commission will hold a hearing in Chicago (at a time and place yet to be announced) -- a hearing that shouldn't even be happening, but is thanks to grassroots activist pressure. The story of this event dates back almost exactly five years earlier, when the FCC in September 2002 announced a series of controversial media ownership rule changes. These rules would have made it possible for a single company to own in a single city a newspaper, up to three TV stations, up to eight radio stations, and an internet service provider -- in other words, a media monopoly for many communities in the United States. Last week, we got some good news on our efforts to bring low power FM to big cities via the Local Community Radio Act now before Congress. All five FCC commissioners are now on record as supporting the idea of revisiting the expansion of LPFM to urban markets like Chicago. Now we need to get the measure to a vote in both Houses of Congress as soon as we can. Please call your Congress member this week and ask them to sign on as a co-sponsor of the LCRA (in the House, it's measure 2802, in the Senate, 1675). If you don't know your Congress member's phone number, you can visit http://www.congress.org or call the Capitol switchboard at 202-224-3121. Your voice will make a real difference, and a personal phone call or letter to your Senator or Representative helps more than just signing the petition. Please forward this message widely. Since many of CHIRP's friends are in northern Illinois, it's important that we get the word out far and wide so we make sure to hit a broad array of members of Congress. Almost Alternative: Chicago Reader Sold To Creative Loafing Inc. The Chicago Reader has been purchased by the Florida-based Creative Loafing Inc. chain of alternative newsweeklies.The purchase also includes the "Straight Dope" syndicated column. Creative Loafing also acquired Washington City Paper in the deal. More on the deal can be found at the Michael Miner's (The Reader's Media Writer) Blog "News Bites"
While sure to have some kind of impact on the Reader's editorial content, it's hard at this point to say what. Alternative newsweekly chains are an inevitability in today's fully converged media landscape, and neighborhood beat reporting has historically not been the sole focus of alternative news weeklies in the first place, so this is hardly a time to announce the death of localism. Time will tell what this will mean for the Reader. Stay tuned.